I'm glad to be home from work. It snowed buckets here which made for a very busy morning and a super fun (i.e. not fun at all) ride home. I'm stopping in with a quick post to let you all I know I'm joining a new DT. Yay! Right?! 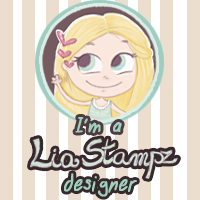 I stumbled across LiaStampz Store and just fell in love with her cute images. I went to check out the blog and low and behold they were having a DT call. What?! Here is one of her adorable images I used to create a card for the Caring Hearts Card Drive. This image is a whole set of Christmas images called Silly Santa Christmas that are perfect for this drive. The original tree has that sweet scallop/stitched border but it just a plain tree. I dressed mine up for Christmas with some hand drawn lights and silver pen garland. I also continued the stamp design up the whole tree then colored with copics. I love how casually you mention that you drew on lights and garland - that takes talent, my dear!!! Something you seem to have in the bucketfuls!! SO pleased for you to be on this design team and judging by the cuteness of this card - we can look forward to many more cute things to come!!! Oh by the way, this one is whistling that happy little tune I told you about!!! Have a fantastic night!! Hugs to you!! Congratulations Kelly! That garland is drawn (drew?) so well, I thought it was something real like fiber or so! Congratulations! That is one awesome Christmas tree there. Enjoy your new gig and stay safe and sound in the snowy weather. CONGRATS on your new DT position, Kelly! I know you will be an asset to the team, and I can't wait to see what you create for them! This is such a charming card! Your coloring is just beautiful, and I love how you added your hand drawn lights and garland...so clever! Congratulations on your exciting news! Your card is fabulous -- such a sweet tree!